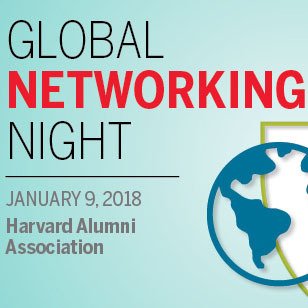 Harvard’s next Global Networking Night is scheduled for January 9th, 2018. This free networking event, held twice per year, draws over 6000 Harvard alumni in 95 cities across the globe. Alumni from Harvard College and the various Harvard graduate schools will attend this event. The Harvard-Radcliffe Club of Westchester is co-sponsoring the Stamford event with the Fairfield club.